Brandon Marshall admitted he came into the Pro Bowl with the goal of winning the MVP award, calling it his Playoff game. After catching a Pro Bowl record four touchdowns — two less than he had during the entire regular season — to go with 176 receiving yards, Marshall had his wish, driving out of the stadium with a brand-new SUV as his prize. 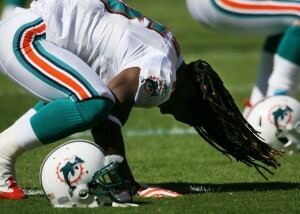 Marshall joined Ricky Williams (2002) and Garo Yepremian (1973) as the third Dolphin to earn the honor. Sure, Marshall’s impressive statistics can be viewed as meaningless when the two teams combined to score 100 points, but just look at the highlight-reel catches the Dolphins wide receiver made in the game. One TD came when he was able to keep his concentration after the ball sailed through two defenders and bounced off Marshall’s own foot. On his final score, he once again caught the ball in traffic, twisting his body in the back of the end zone and dragging both feet inbounds while being held by the defender. When he was interviewed mid-game by NBC sideline reporter Alex Flanagan, Marshall wasted no time in crediting the Pro Bowl quarterbacks for making spectacular plays, simultaneously throwing every Dolphins signal caller under the bus. If you’re counting, the “three or four” Miami QBs would be Matt Moore, Chad Henne, Tyler Thigpen and Chad Pennington (for a few snaps), as well as J.P. Losman, for good measure. And just in case he wasn’t abundantly clear the first time around, Marshall reiterated that the Pro Bowl quarterbacks were responsible for his MVP performance after the game. 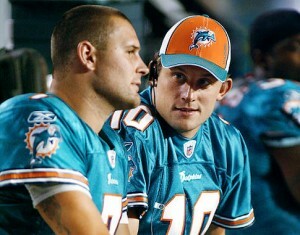 It’s not that Marshall is factually wrong, since the five Dolphins QBs he’s played with were mostly mediocre. But Marshall didn’t exactly help matters, dropping 12 passes (officially) during 2011 season and making countless mistakes on the field. It should also be noted that Moore finished 12th in the NFL in Passer Rating, and that Marshall caught 59 passes for 901 yards and five TDs in Moore’s 12 starts. 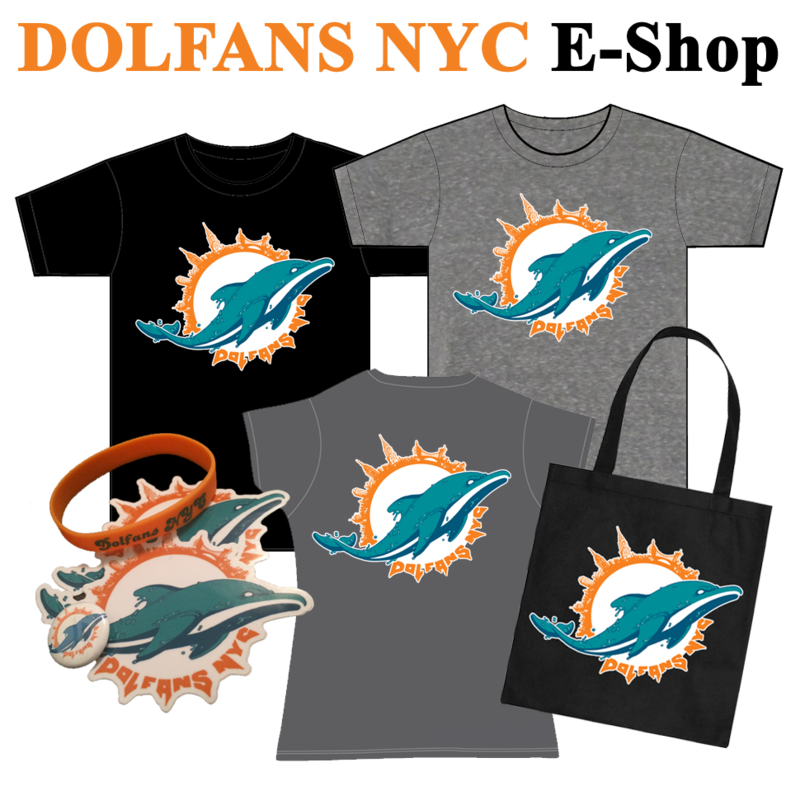 It’s obvious that Marshall, as well as owner Stephen Ross and every Dolphins fan, want an upgrade at the QB position. But calling out his teammates on national television with a wide grin — especially since there’s still a chance that Moore could be back next season — isn’t the right time or place to make his point or help the organization in its search. Marshall’s acrobatic catches and record-setting numbers speak much louder than his words for any interested free agents. Marshall also chose to praise former Dolphins head coach Tony Sparano while referring to Joe Philbin simply as, “the new coach.” Make of that what you will. It’ll be interesting to see who that team will add to throw the ball to the never-outspoken MVP-winner. Like most Dolphins fans, I was surprised (somewhat pleasantly) by Coach Tony Sparano’s announcement that quarterback Chad PenningtonÂ will start overÂ Chad Henne going forward. A little over a year ago, when Miami started 0-3 and Pennington averaged only 138 passing yards per contest while committing four turnovers, the fansÂ wanted him benched in favor of the up-and-coming Henne.Â 21 games later, there’s a growing sense of excitement about Pennington’s return to the field as a 4-4 team clings to its fading Playoff hopes. 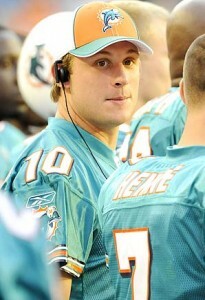 According to beat writer Omar Kelly, the coaching staffÂ felt that “Henne had become extremely predictable,” leading toÂ decreasedÂ confidence in locker room.Â Henne made too many bad decisions and committed far too many costlyÂ turnovers, throwing four interceptions without a single touchdown pass in Miami’s last two games.Â Whether he’s still the Dolphins QB of the future remains to be seen,Â butÂ it’s certainly not inconceivable thatÂ TylerÂ ThigpenÂ will get an extended look later this year or during the offseason. Offensive coordinator Dan Henningâ€™s play calling has certainly raised a lot of validÂ questions, since his system has been more tailored to Pennington’s “water pistol” arm all along.Â Henne averaged 6.9 yards per pass attempt and 10.8 yards per completion his season, both of which are below Pennington’s career averages.Â After three surgeries on his throwing shoulder, Pennington doesn’t have the arm strength to throw deepÂ passes, but then again, Henne has only two completions of over 40 yards in eight games. One factor that can’t be understated is Pennington’s accuracy, which is miles ahead of Henne’s.Â Pennington holds the highest completion percentage (66.1%) in NFL history among players with at least 1,000 pass attempts, and led the NFL in that category during his last full season in 2008 (67.4%).Â He has the 12th-best careerÂ Passer Rating (90.1), and ranked second in the leagueÂ behind Phillip RiversÂ two years ago.Â Â While Henne has thrownÂ four more INTsÂ than TDs, Pennington has nearly twice as many scores as picks over 11 years (though it should be noted thatÂ he threw four costly INTs against the RavensÂ in Miami’s last Playoff game). It’ll be interesting to see how the 34-year-old fares against the Tennessee Titans defense,Â which hasÂ given up the 10th most passing yards but leads the league withÂ 3.3 sacks per game.Â Â Â If Pennington improbably leads Miami back into the postseason, heÂ deserves to winÂ an unprecedented third Comeback Player of the Year Award. 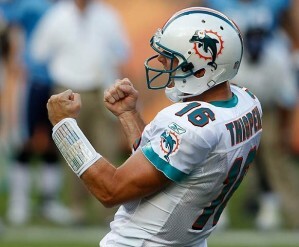 With the NFL season right around the corner, and fantasy football drafts already in full-swing, it’s time to take a look at what to expect from theÂ Miami Dolphins’ skill players in 2010.Â Today, we’ll cover the quarterbacks and wide receivers, with running backs, tight ends, and the defenseÂ to be posted in the coming weeks. Chad Henne, QB -Â All things considered, Henne had a solid 2009 after being thrown into the fire following Chad Pennington’s shoulder injury in Week 3.Â (As a sidenote, I still feel responsible for causing that to happen, because I spontaneously decided to pick up Henne in my fantasy league minutes before that game started).Â Henne completed 60.8% of his passes and had 12 TD passes in 14 games despite having one of the weaker WR corps in the league.Â He threw for over 300 yards in three of hisÂ last five games, andÂ should have no problem continuing that trendÂ with the Dolphins’Â acquisition of two-time Pro-Bowler Brandon Marshall.Â Â Considering that Kyle Orton threw for over 3,800 yards and 21 TDs last season with Marshall as his top receiver, HenneÂ could be in line for a spectacular year if he can improve his decision-making (10 INTs in the final six games).Â He’s a borderline number-one QB, andÂ has more potential than the likes of Donovan McNabb, Eli Manning, and Matt Ryan, all of whom are all Â being draftedÂ ahead of him in ESPN leagues. 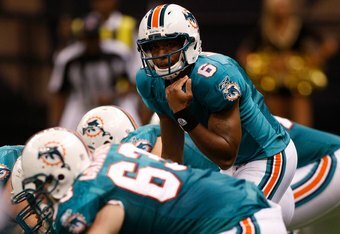 Chad Pennington / Tyler Thigpen / Pat White, QBÂ – Unless you’re in a 14-team, two-QB league (likeÂ me), none of the Dolphins’ backups should be on your radar.Â Thigpen is likely to begin the year second on the officialÂ depth chart, though it wouldn’t be surprising if Miami turned to the veteran Pennington if Henne were to miss any games.Â White, who didn’t complete a single pass last year, is, um, still on the team as of this writing. Davone Bess, WR – Bess had a fantastic sophomore campaign, leading the Dolphins in catches (76;Â 22nd in NFL), receiving yards (758), and punt return yards (209).Â Â Â His stats are bound to take a seriousÂ hit with Marshall firmly entrenched as the top receiver, but Bess should still get his fair share of targets out of the slot.Â Bess is a decent fourthÂ WR in PPR leagues with some upside, and at the very least, is a smart insurance policy if Marshall gets in Coach Sparano’s doghouse. Brian Hartline, WR – Hartline led the Dolphins in TDs (3) and yards per catch (16.3; 11th in NFL) , and finished third on the team inÂ receiving yards (506) as a rookie.Â He dropped only three passes in 54 targets,Â Â and could end upÂ beingÂ theÂ beneficiary ofÂ Marshall’s double-teams if he wins the number two receiver spot in training camp.Â Still, with Bess expected to see more targets and Greg Camarillo also in the picture, HartlineÂ is only worth a late-round flier in standard leagues. Greg Camarillo, WR – Camarillo, who should be fully recovered from a torn ACL he suffered in November 2008, was one of the most sure-handed receivers in the NFL last season,Â catchingÂ the highest number of passes without a drop and a stellar 70% of his total targets.Â He quietly placed second on the team in both receptions (50) and receiving yards (552) in 2009, butÂ stands to see aÂ reduced role behind the quicker and younger Hartline in 2010. Coming soon:Â How will Ronnie “The Wildcat”Â Brown and Ricky Williams share the backfield?